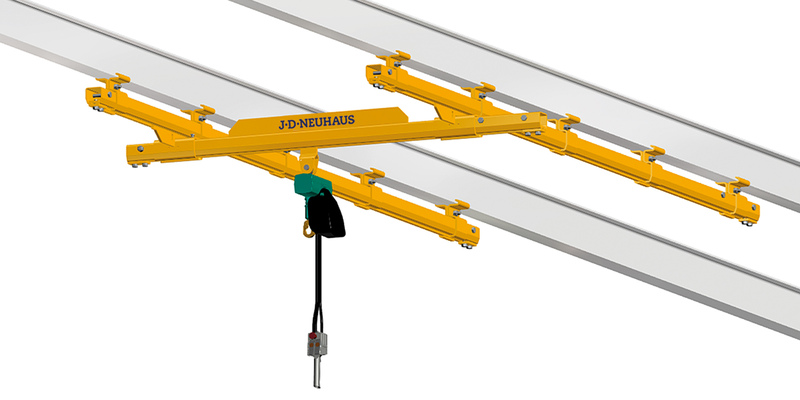 J D Neuhaus (JDN) is implementing a new Hydro Coating on its industry-leading hoist range. The coating not only enhances quality and appearance, but is far more environmentally friendly. JDN takes its corporate and social responsibilities extremely seriously, and moving from a standard hammer finish to the Hydro Coating will contribute to sustainable protection of the environment. In fact, the new Hydro Coating features a percentage of organic solvents that is less than 3%, which is significantly more environmentally-friendly than the former hammer finish. In addition, the coating is silicone-free, which means no wetting failures, an important consideration for automotive or coating plants. Further benefits of the Hydro Coating include optimised adhesion, high resistance to corrosion and oil, and the potential to be diluted with water if required. It offers excellent surface quality, even when refitting, and complies fully with the VOC (Volatile Organic Compounds) Directive. JDN’s lifting equipment is designed to be used in the world’s toughest operating conditions, a fact supported by the company’s mantra of ‘engineered for extremes’. In sectors such as mining, offshore, energy, chemical and construction, safety is the number one priority. From an equipment perspective, this means reliability and robust manufacture, as the margins for failure are typically zero, particularly in long-lift and/or repetitive cycling applications. In addition, the hoists are rated for use in explosion and hazardous dust-laden areas up to ATEX Zone 2, with even higher classifications available upon request. This means that JDN equipment will not generate any sparks or electrostatic discharge. JDN hoists are also required to offer full functionality at all times, regardless of the presence of contaminants such as dust, dirt, heat, cold or seawater. As a result, each component is actually manufactured to a level beyond its standard specification and rigorously tested to ensure that both performance and quality are maximised. In turn, this renders the hoists ideal for use in a wide variety of industries, from automotive, shipbuilding and steelmaking, through to food, glass, leather, printing and papermaking. JDN’s hoists, such as the company’s class-leading air-powered Profi range is available with various control systems and load capacities from 250kg up to an impressive 100T. Alternatively, JDN’s hydraulic powered Profi hoists can be deployed, which are available from 3T up to 100T in lift capacity. Alternatively, the Monorail hoist series is ideal for low-headroom as well as heavy-load applications. The pneumatic Monorail series covers carrying capacities from 10T to 115T, while units from 20T to 100T are also available with hydraulic drives. Among the latest developments to the JDN range of hoists and cranes is a robust new control concept. The company’s JDN-RC (Radio Control) features a solid and extremely compact receiver to suit even hoists with low-carrying capacity. The receiver can be mounted on the hoist or trolley, or at a separate location, in line with specific customer requirements. It allows users to work at a safe distance from the load and take a better viewpoint during operations. Furthermore, the control is ideal for spanning long distances between the hoist and the operator, and represents a sensible alternative to applications demanding a long control hose. The receiver is suitable for use in harsh operating environments, including ATEX (explosive atmosphere) zone 2/22 conditions. A further recent innovation is the introduction of a range of C rail and light crane systems for operation with the company’s established and successful mini air hoist range. Both the C rail/suspension tracks and the light crane systems are rated for use in explosion and hazardous dust-laden areas up to ATEX Zone 2, 22. Featuring high quality standard elements, the modular C rail systems/suspension tracks make for smooth movement of loads in accordance with individual customer requirements. Also offering modularity, the light crane systems adapt easily to load and operating conditions, and are available in four standard profile sizes that provide smooth movement of the reinforced crane bridge.